After the success of our last event, Open Farm Sunday, we’ve been asked many times if we’re going to hold any more events. 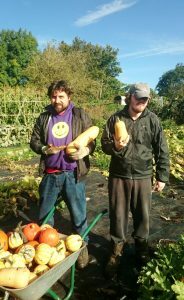 Events are something we want to build on so we can engage with the local community and promote the great work we do at the Farm. This summer has been one of our busiest ever with our new farm shop opening onsite, so we’ve decided to celebrate and are excited to announce our first autumn event. Our barn is old and falling down so we’ve found plenty of old items suitable for burning, the pumpkins are almost ready to be harvested, and the apples ready to be picked, so it’s the perfect opportunity for a bonfire party. So, we’re inviting you to join us on Bonfire Night and enjoy some mulled wine or juice, and spicy pumpkin soup, to celebrate what a busy and fantastic summer we’ve had. This is a free family event with great food and drink. We’ll even throw in some sparklers. Our new farm shop will also be open between 6.00pm and 6.30pm, offering fresh eggs, organic vegetables, herbs and ornamental plants, and a number of wooden products. Sorry, no dogs please (except guide dogs). We have a small car park but space is limited, so please consider other forms of transport if you can. We’ve created a Bonfire Night event on Facebook so you can express your interest, share with friends, and ask any questions you may have. Alternatively, you can leave a comment below. We’ll get back to you as soon as we can.